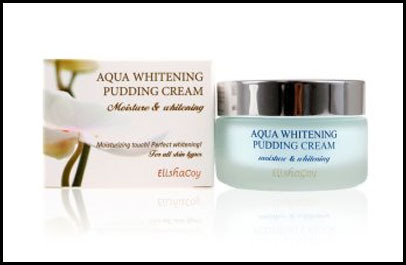 Today I am bringing you the final product in my skincare series: the ElishaCoy Aqua Whitening Pudding Cream. This is my second favourite product in the skincare series, and I highly recommend it for glowing, luminous skin! I apply this moisturiser after I apply the Ice Herb Whitening Water Drop, another ElishaCoy product, which I reviewed in my previous post. It comes in a tub, but the box also contains a little spatula that you can use to scoop the product out, for sanitary purposes. The product itself is true to its name - best described as a gel-like 'pudding'. This sinks into the skin easily and quickly upon application, and smells gorgeous! Again, this is one of those products that I think definitely contributed a lot to the condition of my skin at the time. It was glowing, it was luminous, and it was clear and bright. I must say, ElishaCoy really know their stuff! This moisturiser retails for USD 43 on Korean Creation. And that brings my skincare series to a close! I hope you all enjoyed this series, I know I certainly did. Have a great weekend, everyone!